Now that we have world borders, a spatial database, some PHP code and statistics, - it's time to start the fun stuff: making thematic maps! I've started width choropleth maps (shaded polygons), and the first results can be seen by downloading this KML to Google Earth, or by looking at the images below. 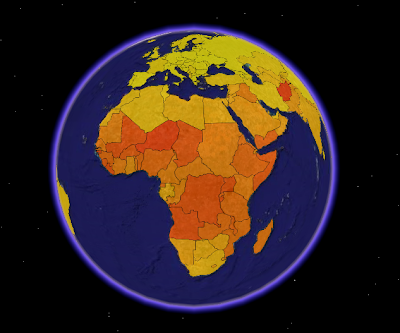 This screenshot from Google Earth is a visualisation of the world fertility (children per woman) 2000-2005. Darker colour means higher fertility. Afghanistan has the highest fertility in the world (7,5 children per woman). The data are unclassified, the countries are coloured according to their fertility value on a colour range. On this image, the fertility values are also represented by the height of the country polygons. I find it easier to see differences between countries by using this visualisation technique. KML is not the optimal format for choropleth mapping in Google Maps. 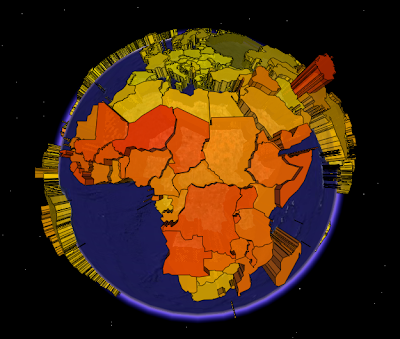 My KML file was too big, so I had to generate a new showing only African countries. Fertility data are from UNdata. World borders can be downloaded on this site. I can not guarantee that the areas represented by statistical values and the mapped areas are identical, since the data are from two different sources. This is really interesting, and a great use of KML and Google Earth. And I think the way you've done the polygons is really attractive. You might think about, if you're having trouble with files that are too large for Maps, going with a view-based NetworkLink, which queries a script based on the view parameters. This works in Maps and Earth. Great work, Bjørn! Your blog is an inspiration! I'm thinking about creating 3D bars like this with cartodb data on a regular leaflet/mapbox map. One can achieve 2.5D with a simple CCS transform: rotateX(45deg), and then one could, perhaps, add 3D bars into the mix. Any ideas, or have you seen this? Previously I've only used KML to create 3D bars, but today I would probably use D3.js or three.js.